The introduction of the new fishing boat has had the major benefit of adding a new fishing adventure to Gone Fishing Charters. We have great pleasure of including Reef Fishing in the many forms of guided fishing that is available. The waters off the East Coast of Tasmania are abundant with all kinds of reefs which in turn is inhabited by species such as the Stripy Trumpeter. 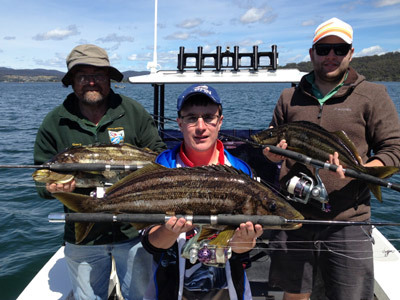 The stripy is a full blown sport fish with many great battles with this fish which is native to Tasmania and surrounding islands. It is a great table fish, possibly one of the best you will encounter coming from the deep blue off the east coast. This is definitely a fish you will need to have a guide and Michael's years of expertise is invaluable in tracking down this prize. 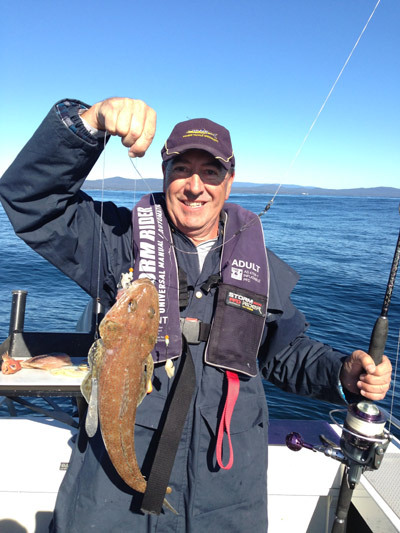 Other fish that could be part of your reef fishing bag will include Silver Morwong, Yellowtail Kingfish, Blue throated Wrass, Albacore and Yellowfin Tuna, a variety of flathead and even a calamari squid. Michael has also caught Marlin and Swordfish around the reefs but cannot guarantee these fish although there is a possibility. Get ready for a new adventure and marvel at the beauty of Tasmania viewed from the ocean. In the summertime we also have the added benefit of viewing so many other sea creatures such as the dolphins and seals as well as the odd migrating whale.